The state of Florida has sentenced Marco Rubio to four more years on the job, a fitting punishment for a miserable senator with one of the worst attendance records in history. Rubio—who tweeted that he would be a private citizen come January before announcing his reelection campaign—justified his about-face by claiming he felt called back into action after the Orlando Pulse attack. What he didn’t talk about in interviews, however, was that the Republican party also desperately needed him to stay in office to maintain a Senate majority. 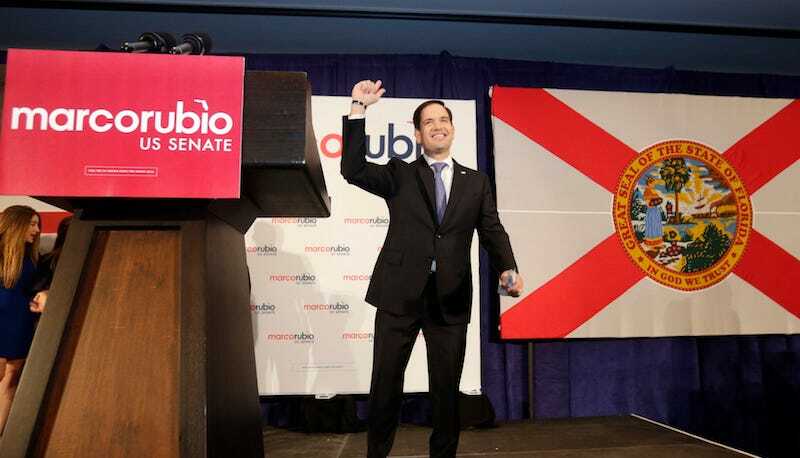 As The National Review pointed out in June, National Republican Senatorial Committee executive director Ward Baker, Senate majority leader Mitch McConnell, and “a bevy of Florida politicos” led an “aggressive push” to get Rubio to run again. Whether Rubio used a deadly attack on a gay nightclub as a pretext for bald political ambition is between him and his god, and it seems his god has spoken. There is no truer hell than the one we make for ourselves. And now he has to wait to lose again in the 2020 presidential election before he can go on Dancing With the Stars.